In 1729 Bach bought a new set of music books for the choir of his church in Leipzig, Erhard Bodenschatz's Florilegium Portense of 1618 probably to replace the church's existing, and presumably dilapidated, copies. This practical and popular volume was the choir's main supply of music. And it is the diverse group of composers from this publication which forms the basis for Patrick Allies and Siglo De Oro's latest disc on Delphian. So we have motets by Orlandus Lassus, Jacob Handl, Andrea Gabrieli, and Hans Leo Hassler, plus a mass and motet by Hieronymus Praetorius. The disc includes the first recording Hieronymus Praetorius's Missa Tulerunt Dominum meum based on the composer's motet of the same name. The motet describes the moment when Mary Magdalene first arrives at Jesus's tomb on Easter Day. So Patrick Allies has used the Easter theme of the mass to create an Easter sequence with the mass at the centre. We start with a pair of motets for Maundy Thursday, Lassus' Tristis est anima mea, a text from the Tenebrae Responsories, and Handl's Filiae, Jerusalem nolite, and then a pair for Good Friday, Praetorius' O vos omnes with a text from Lamentations, and Hasslers' Deus, Deus meus setting Psalm 63. For Easter Day we have Praetorius's motet Tulerunt Dominum meum and the mass, with Andrea Gabrieli's Maria stabat ad monumentum in the middle, and Praetorius's Surrexit pastor bonus, setting the Communion for the Mass on Easter Day. This is satisfying both as a music and a liturgical sequence, with the motets having the advantage of threading through the events of the Easter story. 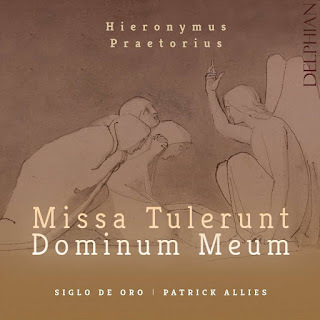 Praetorius's mass is richly textured music with a glorious Italian influence (even though Praetorius himself does not seem to have travelled widely). The choir makes a lovely vibrant sound, youthful in timbre but beautifully engaged with a nice clarity to the texture. They make the music live, bringing out Praetorius's gorgeous textures and rhythmic felicity. The motets are similarly engaging, and Patrick Allies seems to encourage his young singers to really bring out the drama in the pieces, whilst still ensuring a suave musicality. The names on this disc are not big ones, and Hieronymus Praetorius deserves to be far better known, and Siglo De Oro have assembled a delightful disc which is far more engaging than the slighly dry list of composers might suggest. Highly recommended.